I have embraced being a (temporary) Texan. I have obviously already forgotten about the hot, humid summer..
One problem, though: my dates are all messed up. Time is literally flying by. I saw an event for the end of November and thought it was weeks away. It was warm and sunny at the time… my internal clock had not registered that yes, it is indeed almost winter. At home, they’ve received more snow and cold weather than I can recall seeing in November. I would be hard to pity me, though.. That warm spell disappeared and it is cold again. It will be a low at freezing point tonight. And I forgot (or did not pack?) my winter cycling gloves in Canada. Either that, or they are lost. 😦 I hope it is the former. The warm weather partially explains my penchant for raw eats despite the season. The other, is that raw is easy to make and this was a recipe I knew would be fabulous. When Rob and I visited Ellen and Andy on our road trip to Houston, we shared a veritable feast for breakfast and these were my favourite treat. 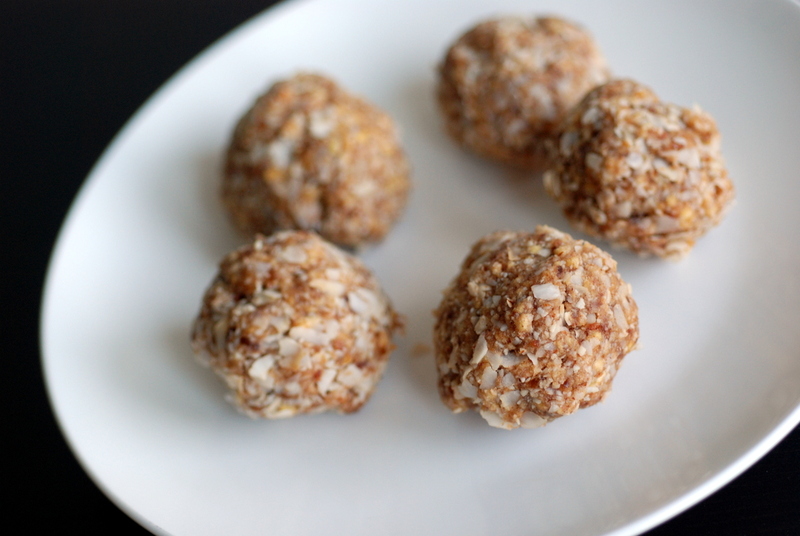 I have made raw (chocolate) macaroons before, but these were simply delightful. 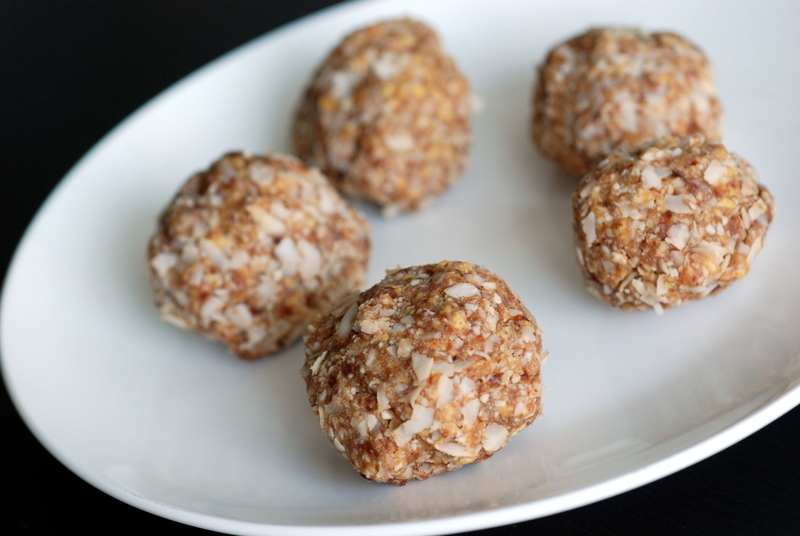 Apple, cinnamon and caramel-like dates are pulsed together with almonds and coconut for an autumn/winter-inspired treat. A touch of maple syrup and a sprinkle of salt made the flavours veritably pop. These are so simple to make, but absolutely delicious. Are you building your holiday treat roster yet? What are you excited to make? 1. In a food processor fitted with its S-blade, process almonds into a fine flour if you have not done so yet. Add the dried apples, dated, salt and cinnamon and process until well combined. 2. Remove from food processor and and place in a bowl. Add coconut and maple syrup and with your hands, incorporate the coconut into the dough. Roll dough into 1″ balls. 3. You could simply refrigerate the dough but if you have a dehydrator, I recommend dehydrating them a bit. Thus, place on a mesh-lined dehydrator sheet. Dehydrate for 8-12 hours at 115F until they are dry but still retain a bit of moistness in the centre. Refrigerate in an airtight container. Looking forward to trying this recipe Janet. Might just add a few more dates and skip the maple syrup. I need to move to Houston too. It’s freezing and raining in ATL. Gross. Fiber balls, love it! I think most dried fruit would work well here. Cranberries are definitely festive. Isn’t it hard to keep track of time when you live somewhere warm? That was the hardest part about moving to California for me. It still doesn’t feel normal even after nine years. These macaroons sound delicious–maybe I should get a food processor one of these days! 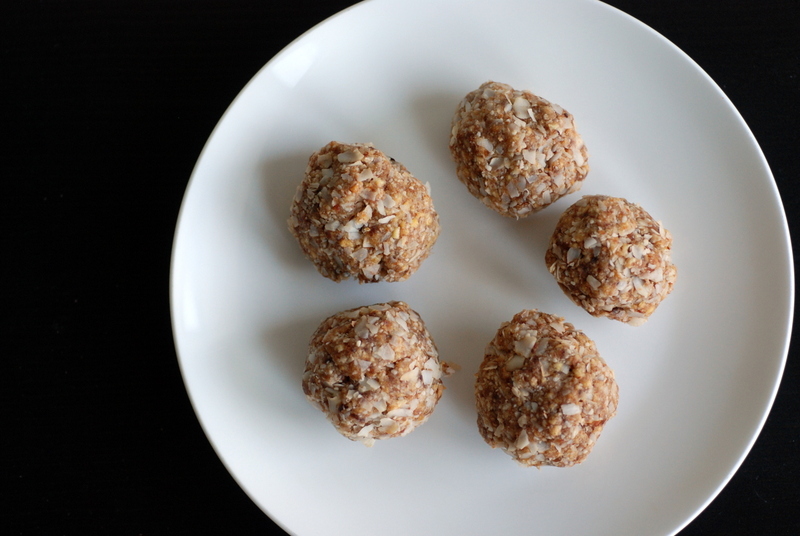 These balls were a hit at a raw food potluck. I do love them. Hey Ellen, I knew I wanted to make these after you made them (they were so good!) but had to wait until I found dried apples. And then, once I found dried apples, I had to refrain from eating them just by themselves. And then, finally, I said enough is enough: MAKE THOSE MACAROONS! Sometimes I try to make things in the dehydrator when Rob is gone but these were too good not to, once I had the idea in my head…. But for bookmarking, I use a combination of ChefTap, pinterest and emails. It probably doesn’t make much sense to duplicate everything but I do it anyways… If I see the recipe make the rounds, I know it will be a keeper and try to make it sooner rather than later. I also try to stick to bloggers/cookbooks that I know I have liked in the past. I have been pretty lucky – not so many kitchen duds lately. Although there is a funny phenomenon. Once I put it on the blog, I am less likely to make it again, unless it is for a gathering and I want to make favourite recipes. Rob, however, is more likely to repeat recipes. I’m getting increasingly fed up with the cold weather here so count yourself lucky! These raw treats look good. Do they taste apple-y? I’ve never incorporated dried apple into a recipe before. Apparently it’s going to be chillier here next week too. Boo. Oh now whose do sound good. Nice flavours! Have you heard of Scottish Macaroons? You’ll never guess what is in them. Nothing like your ingredients, not nearly as healthy either!